An all keg pub which has the same selection that blue_scrumpy posted about. There is a reasonably interesting exterior and interior to the pub. I went for a Carling in here and only cost me 2.10 so at least you are getting great value for a lager unlike some places. The bar maid was friendly when I came in, as were the locals. Seems to have a theme around the 1950/60s era, with pictures of music and film stars from around that time ( e.g. Elvis and Marilyn Monroe), music was also playing which I assume was produced around that time as well. There was a jukebox in there with a poster that said it was free, however I didn't see anyone using it. This pub felt quite comfortable really, people minding their own business. It was quite amusing watching some of the older lads go to the bookies next door to put a bet on and then come into the pub to watch the horse racing on the television. Overall not a terrible place really, its all keg but if you fancy a cheap keg beer in a decent environment then it's worth a look in. To say it's so cheap it's a lot less chaotic than its counterparts on Renshaw Street. All keg which is a shame, as it has a nice interior. Could do so much better. 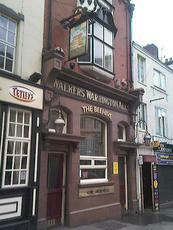 The Beehive is typical of many Liverpool City Centre boozers. It's got a nice, traditional interior with some impressive tilework and is frequented by an ageing crowd. Beers are all keg - Guinness, Strongbow, San Miguel, Carlsberg, Carling & Tetleys Bitter & Dark Mild. It's worth trying if you've never been before. But with so many better pubs in Liverpool, it's unlikely you'll return. Went in this place last night at the insistance of a mate. It was packed to the rafters with male and female customers aged from 40 to 70. A singer who must have been 60 was belting out classic songs. No ale available, just Tetley Smoothflow, Guinness and Eurofizz. The temperature was stifling but when we attempted to stand outside we were forced back in by aggressive bouncers. I paid a quick visit on Easter Sunday morning and it was as quiet as a morgue. I remembered the landlady but she didn't remember me. That just about sums it up. It opens earlier than most city centre pubs but only sells,Smith, smoothy and lagers which aren't my cup of tea.